Attendance of this workshop is free, but registration is required. Please register by completing this form until May 17, 2017. A joint event organized by Institute for Advanced Study at CEU and the Center for Eastern Mediterranean Studies at CEU. “Gifts make slaves as whips make dogs.” Dangerous, violent, and self-destructive gift-giving remains an alluring challenge for historians and anthropologists almost a hundred years after Marcel Mauss’s landmark essay on the gift. 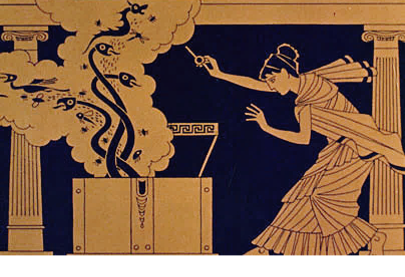 Globally, the notion of toxic and fateful gifts has haunted mythologies, folklores, and literatures for millennia. Yet even in everyday practice—to say nothing of more brittle spheres such as politics or religion—it is not always easy to draw a line between voluntary giving and coercion, between generosity and excess, between benevolence and insult, and between gratitude and bribery. No matter how much modern consumerist ideology pursues and tries to exploit the idea of a “pure” gift that is gratuitous, wholesome, and pleasing, the ambiguity of gift-giving is deeply embedded in human culture: the dark side of the gift is the shadow of the perfect gift. Drawing together anthropologists, historians, literary scholars and theologians, this workshop pursues the controversial and dazzling subject of dangerous gifts and pernicious transactions from antiquity to the digital age. We ask what is the politics of dangerous gift-giving? When do gifts do the donor more harm than good? In what circumstances are religious gifts ambivalent? When do they become treacherous? And are digital gifts more dangerous than beneficial? See the abstracts of the lectures here. György Geréby (Department of Medieval Studies, CEU) “Every Good Endowment and Every Perfect Gift is from Above”: James 1:17 in Patristic Exegesis. Davide Torsello (Business School, CEU) How History Converted Religious Offerings into Bribes: the Japanese Case. István Perczel (Department of Medieval Studies, CEU) An Anarchist Ecclesiology? Saint Symeon the New Theologian on the Eucharistic Gifts and Unworthy Priests. Tudor Sala (Institute for Advanced Study, CEU) When the Gift of Divine Life Kills: The Poisonous Eucharist in the Early Church. Russell Belk (School of Business, York University) Little Nothings: Intangible, Ephemeral, Digital Gifts. Sándor Hites (Institute for Literary Studies, Hungarian Academy of Sciences) Nationalism as Gift Economy: The Unintended Consequences of 19th century Hungarian Aristocratic Donations. Ellen Litwicki (Department of History, State University of New York at Fredonia) Pernicious Transactions in the Workplace: the Society for the Prevention of Useless Giving. Erica Benner (Institute for Advanced Study, CEU) Machiavelli's Prince: A Gift to the Prince or a Gift to the People? Neguin Yavari (Institute for Advanced Study CEU) Ominous Gifts and a Job Interview in Umayyad Damascus. Tracey Sowerby (Institute for Advanced Study, CEU) Relics and Other Religious Items as Dangerous Diplomatic Gifts at the Turn of the Seventeenth Century. Russell Belk, Tolga U. Esmer, Jan Hennings, Sándor Hites, Ellen Litwicki, Tudor Sala, Tracey Sowerby.